Watched the wonderful I Know Where I’m Going this week. We seemed to have the weather for it. Wendy Hiller is wonderful and just as wonderful is her leopardskin clutch that Roger Livesay seems to be making a grab for in this shot! So – after whiling away a lazy afternoon watching I Know Where I’m Going last week, this week I went out with a chum to see the Bob Marley documentary directed by Kevin Macdonald – coincidently, he’s Pressburger’s grandson – so it was kind of keeping it in the family with the two films. 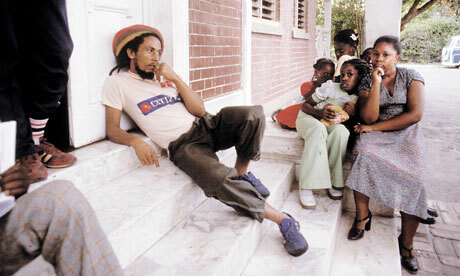 Marley is a fascinating documentary, a real insight into Bob Marley’s life, his family, his dreams, his music. With footage never seen before and permission from Marley’s family to use it, interviews with his various wives, girlfriends, children and many people who worked with him – Kevin tells the story of an extraordinary man and musician who sadly died so young – just 36. Definitely recommended viewing! Be prepared for a visual delight! Can’t see any reviews yet but I will be there as soon as it’s opened for sure. What do you think of the new Galaxy ad? At first I thought it was a look-alike but it turns out it’s original footage of Ms Hepburn that’s been CGI’d. I like the ad, think it’s good fun – and her family obviously licensed the use of the footage. Nice squidgy little handbag anyway – perfect for posing your co-ordinating chocolate!